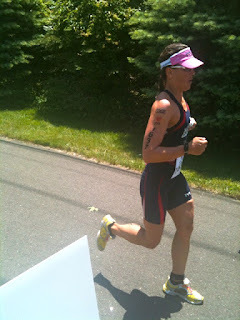 Here we go......the Quassy race report! Let me first begin with the answer to the question I posed after Wildflower.....which race is the toughest? Wildflower or Quassy? Like childbirth (cuz really, if you remembered that pain why does anyone have more than one child?? ), a hard race gets fuzzy with each passing day after the event. For instance, last year after the race, I said NO WAY I’M EVER DOING THAT RACE AGAIN. The day after the race, I said, no way I’m doing that race again....maybe. By spring of this year, it was.....hmmmm.....Quassy fits perfectly with my race schedule and I really like Rev3 events. Yes, it’s hard but I’ll do it! Plus I have a bit of a score to settle with myself and that course. Oh, wait. Right - the answer to the question?? Quassy is hands down the winner of the hardest course I’ve ever raced. That’s how it played out. By the end of March I knew I would be back in CT to tackle the hills. But after Wildflower and IMTX, I really wasn’t ready to travel again. I would have much preferred a local race. It’s all good though, I arrived Thursday night for the Sunday race. Friday was spent putting my errrrrr Sonja’s bike together, eating, riding some of the race course, quick run, chatting up my other BFF Terenzo (sorry, no photo proof), and meeting some friends for dinner. Saturday, more of the same but included registration, bike check-in and a drive of the run course. Oh boy, what the hell was I thinking doing this race again. In the first 6 miles of the bike, there was already 900 feet of climbing!! And the run course? Miles 3 - 7 are uphill. Seriously. I slept great Saturday night but woke up a bit nervous! I slammed some regular coffee (yippee caffeine!!! 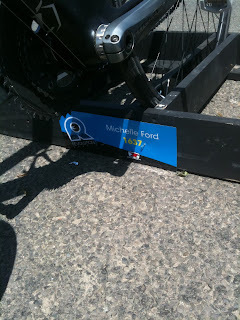 ), a mix1 and I was on my way to the race course. As always, I lined up for the swim and took it out a bit hard to see who was coming with me. Well, a girl was with me - actually in front of me and took off!! I tried to stay in her bubbles but that only lasted a minute. She was gone! After that I was all alone in the swim. Not too much traffic but a bit of dodging of the slower swimmers after the first turn buoy. I felt a bit lackluster, kind of blah...but I kept a good rhythm to my stroke. 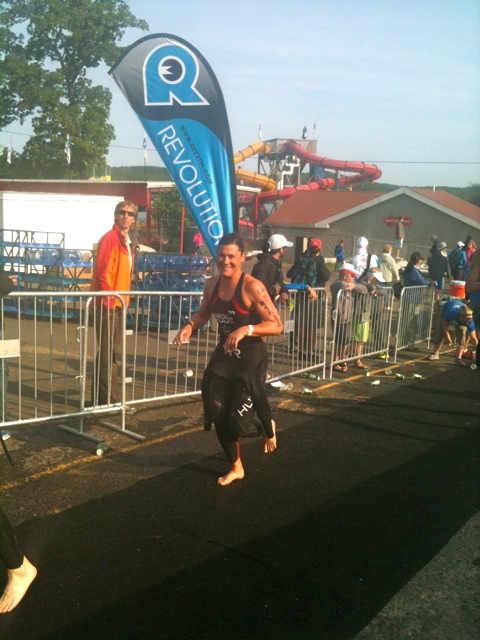 As I ran up to transition I saw Sonja who was at Quassy working for Rev3. She was taking pictures and cheering! So nice to see a familiar face. I have a bit of work to do with my transitions, I was slow again! As much as l love my TYR carbon kit, I have a problem finding the darn pockets in the back to get my First Endurance Liquid Shot in! I’m sure it looks pretty funny watching me contort myself trying to figure out where the darn things are. Ahhh, the bike. Thanks to Sonja, I HAD a TT bike to ride for the race. Although it was strange to be taking her bike on its last race ride (more on that later). I had fiddled with the adjustments the day before and had hoped I had the seat height OK. It’s just so hard to tell without someone else taking a look at my position. Plus, her aero bars are bent so that was also a bit of an adjustment. As I left transition, I looked down at my Garmin and saw that it wasn’t registering cadence. WTF? Are you kidding me? I lugged this power tap wheel all the way to CT and now I wasn’t going to get any data? Un-freaking-believeable. For those keeping track at home, that's 0 for 2 for me gathering power data at races for the year. I got over that and just tried to settle into the ride. From the get-go, I could tell my legs were tired. 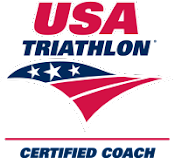 My quads still felt a bit loaded up from the last couple of weeks.....and girls (not from my age group except for the one who was practically done with the bike by the time I got on) were passing by me like I was standing still. I’m not really used to that! Crap. Is my brake rubbing? I had checked it in transition so unless something had happened on the way out....it wasn’t the brake. It was me. 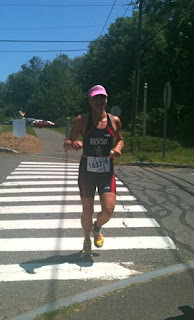 So, I concentrated on my nutrition and getting up those darn hills as best I could. I set up bogies for myself to keep me motivated and on track. My legs got just a bit better as time went on but as I looked at the time I realized there was no way I was going to beat my time from last year. And I flatted last year and rode 20+ miles with a squishy tire. Wow. That was kind of deflating (pun intended!). I didn’t give up though and kept pushing those final miles. Time for the run.....I knew I had set myself up well nutritionally speaking for the run and my main goal was NOT to walk any of the run like I had last year when I bonked. I didn’t care if I shuffled up those hills, I was not going to walk. The run starts off gently by taking you downhill but then at 1.5 miles turns and starts uphill for a bit. I felt good. I felt light on my feet. I was surrounded mainly by men and they were clomping along. But, I was also mainly passing so that was good. At mile 3.5, the course takes a right turn and starts the uphill. I slammed the remainder of my liquid crack (First Endurance Pre-Race) and focused on the task at hand. Don’t blow up on the hills, adjust your pace and heart rate so that you can continue running (slogging) uphill. I was doing it!! There was a guy just in front of me (age 41 with a green and white kit) and I just decided that I was going to keep with him. We traded places, ran shoulder to shoulder, and kept each other going though we never spoke. At mile 7, there was finally some gentle downhill and I really started to pick up the pace. 41 was still with me and we were working together. Sonja was at the top of the hill taking pictures and yelled at me - you are running strong! Relax your left hand and shoulders, just 4 more miles! I still felt good......which lasted until mile 10.5. My legs started feeling like bricks and I was slowing down. Push through, push through.....41 ditched me. Mile 12 one last evil uphill and then down to the finish. C’mon!! Finally, the end was in sight. I was very happy with my run!! Tough race but I'm glad I trekked out to Quassy for the event. Initially, it looked like I was a bridesmaid once again. 2nd place in my age group. 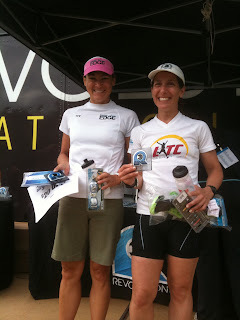 But it turns out the woman who took off at the start was 3rd overall so I got bumped to 1st place! Coolio! A big congratulations to Angela Naeth who took 3rd Pro behind Julie Dibens and Mirinda Carfrae!! Will I race this again??? Ummmm. Ask me next March:)!! A huge thanks to Kompetitive Edge for all of their support!! And to all of my fueling and everyday nutrition sources :mix1, Justin’s Nut Butter, Love Grown Granola and Nuun - thanks for keeping me going:)!!! Nice RR Michelle! Congrats on an awesome race on a tough course. Hey how do you do the Pre-race on the run? I wanted to do that for that extra kick - but couldn't really figure it out. Do you mix it with water & put in EFS shot tube?